Ahhhhhhhhh, its so nice and quiet in the house today! The kids were home all weekend, then had no school yesterday so I was in desperate need of some Mama quiet time! I still needed to make 1 more thank you card to send off so I grabbed one of the sets I just got, Peace Within. I think this set is just darling! If my cats were allowed to go outside I could totally see our kitty Bismarck draped on one of the adirondack chairs like this! 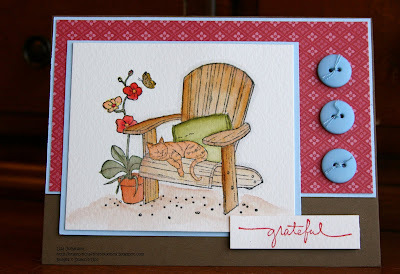 These colors come from this weeks color challenge over at Splitcoaststampers(CC254). I used Soft Suede for the base of the card, and the main image and sentiment are stamped on watercolor paper(I love that stuff!). Bashful Blue is used as the backing for both the main image and the Ruby Red DSP thats used. 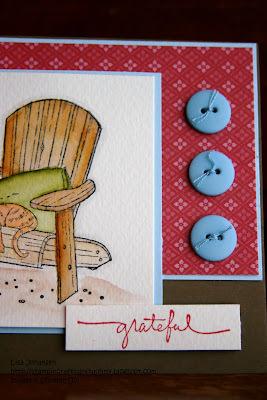 I totally went outside of my comfort zone and added buttons to the card to give it a little extra detail. The sentiment is popped up with dimensionals. Great Job... I like the buttons.. and the layout is cool..